Panaji, January 31: In an unusual sight, a tube inserted through his nose as he has been ailing for quite some time, Goa Chief Minister Manohar Parrikar made sure he works for his people with utmost care and honor. Goa CM Manohar Parrikar presented the state budget while being seated in full hosh and josh. 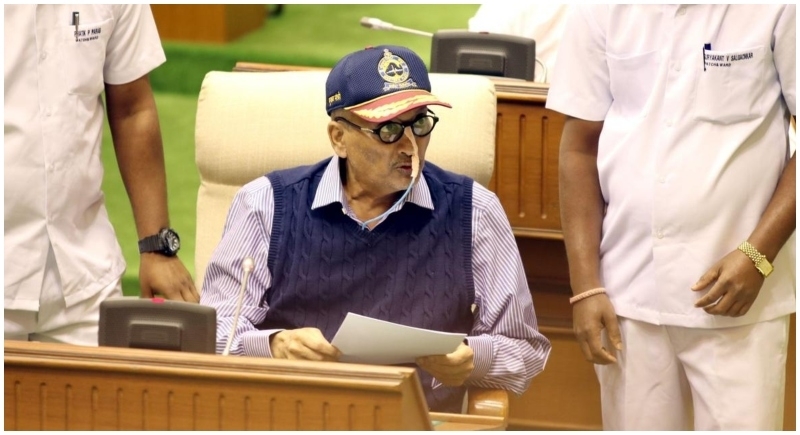 CM Parrikar asserted that Goa’s revenue surplus is estimated to rise to Rs 445.10 crore in 2019-’20 from Rs 144 crore in 2018-’19. CM Parrikar said, “Today, once again I promise that I will serve Goa with sincerity, integrity, and dedication until my last breath. There is a josh, that is too high and I'm fully in hosh." The Chief Minister who holds the finance portfolio, said that according to the Economic Survey presented in the Assembly, the state would grow 10% in the coming year – from a gross state domestic product of Rs 77,171 crore in 2018-’19 to Rs 84,888 crore in 2019-’20. Moreover, the public debt receipts are estimated at Rs 2,432.88 crore, resulting in a fiscal deficit of Rs 1,418.65 crore. The primary deficit is estimated at Rs 2,930.97 crore. The state share of central taxes for the year 2019-’20 is estimated at Rs 3,336.47 crore as against Rs 2,979 crore estimated for the previous year, representing an increase of 12%. the chief minister said. He added that allocation for capital account expenditure has been increased by 18.29%, compared to the budget estimate of 4,216.25 crore for the previous year. The chief minister said his government has continued to lay stress and thrust on agriculture, education, health, information technology, employment and the overall sustainable economic development of the state.